If you’ve played either Pugmire or Monarchies of Mau, you know how this works. Each story, you start off with two Fortune in the Fortune bowl. Players experience setbacks or play into their personality traits to add Fortune to the bowl, and anyone in the party can ask to take a Fortune from the bowl. If no one says “no,” the Fortune is removed and the person using Fortune can reroll the die or modify the world in some small way. I like Fortune because it’s a good example of a mechanic that works better through use than through explanation. Let me digress a bit: As a designer, I prefer to underwrite rules instead of overwriting them. “Underwritten” rules are rules that don’t spell out every possible permutation nor heavily explain why they work the way they do, whereas “overwritten” rules explain everything and often force the players into specific, channels. Whether a rule falls on one side or another is fairly subjective, and both approaches have their problems and benefits. I’m just putting out there that I generally err on the side of leaving players room for interpretation, instead of spelling everything out. Next blog, I’ll talk some more about how to award Fortune as a Guide, and why the systems for Pugmire and Mau are slightly different. Oh, this is a great idea of some articles. 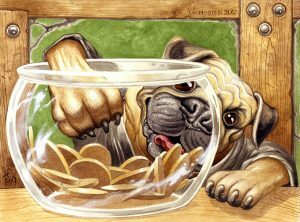 I think the Fortune mechanic in Pugmire & Mau is one of the best implementations of “action points” I’ve seen. Nice to see some insight into the decision-making & advice on using them.